Lafayette's French compatriot, Rochambeau, joined Washington's army outside New York City with a French army of his own. Washington was planning to attack the vital British base there. Some historians see this as a diversion, or an effort to gain more support for his army, but perhaps it was a genuine goal of Washington. Instead, at the urging of Rochambeau, Washington decided to move the combined army to Virginia, 450 miles away, and strike Cornwallis. The French navy under DeGrasse could stay in the North Atlantic until the end of October when the Caribbean hurricane season ended, and so the French admiral sailed to the Chesapeake Bay to prevent any escape or rescue of Cornwallis's army by sea. On August 20th, Washington and Rochambeau began the long journey from New York to Virginia. DeGrasse defeated a British fleet in the Battle of the Capes on September 5th, blocking a British escape by sea. In 1780, 5,500 French soldiers landed in Rhode Island to assist their American allies in operations against British-controlled New York City. Following the arrival of dispatches from France that included the possibility of support from the French West Indies fleet of the Comte de Grasse, Washington and Rochambeau decided to ask de Grasse for assistance either in besieging New York, or in military operations against a British army operating in Virginia. On the advice of Rochambeau, de Grasse informed them of his intent to sail to the Chesapeake Bay, where Cornwallis had taken command of the army. Cornwallis, at first given confusing orders by his superior officer, Henry Clinton, was eventually ordered to make a defensible deep-water port, which he began to do at Yorktown, Virginia. Cornwallis's movements in Virginia were shadowed by a Continental Army force led by the Marquis de Lafayette. The French and American armies united north of New York City during the summer of 1781. When word of de Grasse's decision arrived, the combined armies began moving south toward Virginia, engaging in tactics of deception to lead the British to believe a siege of New York was planned. De Grasse sailed from the West Indies and arrived at the Chesapeake Bay at the end of August, bringing additional troops and providing a naval blockade of Yorktown. He was transporting 500,000 silver pesos collected from the citizens of Havana, Cuba, to fund supplies for the siege and payroll for the Continental Army. While in Santo Domingo, de Grasse met with Francisco Saavedra de Sangronis, an agent of Carlos III of Spain. De Grasse had planned to leave several of his warships in Santo Domingo. Saavedra promised the assistance of the Spanish navy to protect the French merchant fleet, enabling de Grasse to sail north with all of his warships. In the beginning of September, he defeated a British fleet led by Sir Thomas Graves that came to relieve Cornwallis at the Battle of the Chesapeake. As a result of this victory, de Grasse blocked any escape by sea for Cornwallis. By late September Washington and Rochambeau arrived, and the army and naval forces completely surrounded Cornwallis. As troops from New York reached Williamsburg, they joined with the forces of the Marquis de Lafayette who had been shadowing Cornwallis' movements. With the army assembled, Washington and Rochambeau began the march to Yorktown on September 28. Arriving outside the town later that day, the two commanders deployed their forces with the Americans on the right and the French on the left. A mixed Franco-American force, led by the Comte de Choissey, was dispatched across the York River to oppose the British position on Gloucester Point. 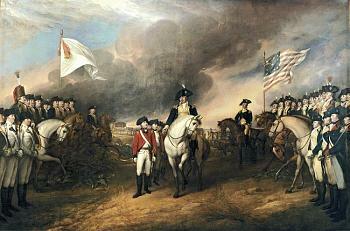 In Yorktown, Cornwallis held out hope that a promised relief force of 5,000 men would arrive from New York. Outnumbered more than 2-to-1, he ordered his men to abandon the outer works around the town and fall back to the main line of fortifications. This was later criticized as it would have taken the allies several weeks to reduce these positions by regular siege methods. On the night of October 5/6, the French and Americans began construction of the first siege line. By dawn, a 2,000-yard long trench opposed the southeast side of the British works. Two days later, Washington personally fired the first gun. 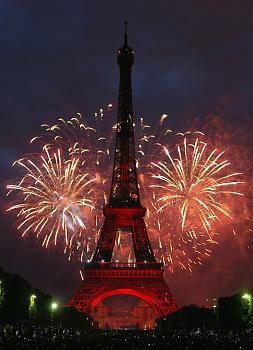 For the next three days, French and American guns pounded the British lines around the clock. Feeling his position collapsing, Cornwallis wrote to Lieutenant General Henry Clinton on October 10 calling for aid. The British situation was made worse by a smallpox outbreak within the town. On the night of October 11, Washington's men began work on a second parallel, just 250 yards from the British lines. Progress on this work was impeded by two British fortifications, Redoubts #9 and #10, which prevented the line from reaching the river. The capture of these positions was assigned to General Count William Deux-Ponts and Colonel Alexander Hamilton. After extensive planning, the attack moved forward on the night of October 14, with Deux-Pont's French troops seizing #9, while Hamilton's Americans captured #10. Immediately after the redoubts were captured, American sappers began extending the siege lines. With the enemy growing nearer, Cornwallis again wrote to Clinton for help and described his situation as "very critical." As the bombardment continued, Cornwallis was pressured into launching an attack against the allied lines on October 16. Led by Colonel Robert Abercrombie the attack succeeded in taking some prisoners and spiking six guns, but was unable to breakthrough. That night, Cornwallis shifted 1,000 men and his wounded to Gloucester Point with the goal of transferring his army across the river and breaking out to the north. As the boats returned to Yorktown, they were scattered by a storm. Out of ammunition for his guns and unable to shift his army, Cornwallis decided to open negotiations with Washington. At 9:00 AM on October 17, a single drummer mounted the British works and beat the long roll as a lieutenant waved a white flag. The fighting at Yorktown cost the allies 72 killed and 180 wounded. British losses were higher and included 156 killed, 326 wounded. In addition, Cornwallis' remaining 7,018 men were taken prisoner. Meeting at the nearby Moore House, Cornwallis attempted to obtain the same favorable terms of surrender that Major General John Burgoyne had received at Saratoga. This was refused by Washington who imposed the same harsh conditions that the British had demanded of Major General Benjamin Lincoln the year before at Charleston. With no other choice, Cornwallis complied and the final surrender documents were signed on October 19. At noon the French and American armies lined up to await the British surrender. Two hours later the British marched out with flags furled and their bands playing "The World Turned Upside Down." Claiming he was ill, Cornwallis sent Brigadier General Charles O'Hara in his stead. Approaching the allied leadership, O'Hara attempted to surrender to Rochambeau but was instructed by the Frenchman to approach the Americans. As Cornwallis was not present, Washington directed O'Hara to surrender to Lincoln, who was now serving as his second-in-command. With the surrender complete, Cornwallis' army was taken into custody rather than paroled. Shortly thereafter, Cornwallis was exchanged for Henry Laurens, the former President of the Continental Congress. The victory at Yorktown was the last major engagement of the American Revolution and effectively ended the conflict in the American's favor. After Cornwallis's costly victory at Guilford Courthouse, North Carolina in March 1781, the British army in the South withdrew to the safety of Wilmington on the coast. Greene seized the opportunity and attacked British posts in the Carolinas. Cornwallis advanced into Virginia, vainly hoping that Greene's American army would follow - or that his efforts in the Old Dominion would ruin Greene. Cornwallis joined other British forces in Virginia and thoroughly raided the state with little opposition from the outnumbered American army under Lafayette, although clashes did occur at Spencer's Tavern and Green Spring, among other places. Old Point Comfort, the site of modern Fort Monroe, had been suggested as a base to Cornwallis by Sir Henry Clinton, his superior in New York. The site was swampy and did not dominate the mouth of the James River, so Cornwallis opted instead for the second suggested location for a base, Yorktown, on the James-York Peninsula, which he occupied on August 1st. Near the mouth of the York River, it was a decent naval base. Since the river was constricted to the width of half a mile, cannon on the bluffs, where the panorama above was taken at the modern Victory Monument, and also on bluffs further upstream, and from Gloucester Point on the opposite shore, made it costly for an enemy navy to approach the town or pass upriver. The threat of fire-ships in the river also made any potential French move up the river costly. Throughout the coming siege, the allies worried that Cornwallis might cross the river and break through allied lines on Gloucester Point or escape upriver. Despite pleas to do so, the French admiral refused to send ships upriver, probably for good reason. Not all of the arriving allied troops marched 450 miles. Some sailed from the northern end of the Chesapeake Bay to the James River, and some French troops arrived from the Caribbean. Many landed near here, where College Creek empties into the James River. These troops joined the troops marching overland and Lafayette's men at Williamsburg, which became a base for the operation. With the arrival of allied troops on September 20th, any hope that Cornwallis had for an escape overland was now dashed. If the French Navy continued to hold the mouth of Chesapeake Bay as promised, victory was nearly assured. The combined armies moved from Williamsburg to Yorktown on the 28th. Having had little warning of the trap, and having received assurances as early as September 11th of help to arrive soon from New York, Cornwallis was now bottled up in Yorktown. With a strong allied force several times his size approaching, Cornwallis hastened his efforts to entrench. The British works were still weak by the time the Allies arrived. Some people, then and now, believe that the British engineer in charge intentionally dragged out the process in order to line his pockets. Fortunately for the British, much of Cornwallis' position was behind the swampy Yorktown Creek, shown above, which had steep cliff-like banks. This effectively prevented assault along most of his line, greatly simplifying the British defense effort. Along the open front on the eastern side of Cornwallis' position, he built several outworks. In front of the right side of the exposed eastern portion of his defenses was built the Untouched Redoubt, which was abandoned, but also the Pigeon Hill Redoubt on slightly higher ground in front of his main defenses as well as a twin redoubt nearby. Because these works were weak, and because of promises of a relief expedition from Gen. Clinton, Cornwallis abandoned these outworks to the enemy with only a skirmish. Had he manned them, he may have been able to hold on long enough for help to arrive. There were also risks to this option, that of losing men needed for a successful defense, and the risk of his army being out-maneuvered or put into confusion outside of his strongest defenses. Although the modern Pigeon Hill Redoubt is a reconstruction like many of the earthworks now at Yorktown, the Untouched redoubt is original. Cornwallis also had outworks built on his left, behind Wormley Creek, which empties into the York River east of Yorktown. These were not enclosed entrenchments but included abatis to their front - essentially felled trees. The dam and road shown here existed at the time. Downstream on the left of the panorama the creek flows into the York River, and behind the camera, further along the road, is the Moore house, which we will see later. The British forward position at the Pigeon Hill Redoubt was abandoned at least in part because of the threat of it being turned by an American advance here at Wormley Creek. On September 30th the works here and at Pigeon Hill were found empty by American troops. Next, we'll take a look up the arm of the creek visible on the right of the picture. The ravines which descend down to Wormley Creek were ideal locations for the allies to approach the main British position and begin digging siege lines. In the ravine above, the Americans had a covered approach and a protected area in which to store equipment. This use of terrain simplified American efforts to build their section of the 1st Parallel, also known as the 1st Siege Line. A zig-zag sap was dug forward from the top of the ravine then a line was dug parallel to the British line, the 1st Parallel. The picture above is looking down a sap which was dug forward at an angle from the 1st Parallel so that a second parallel could be dug closer to the British line. This is a park service sign featuring an excerpt from a military manual which shows how a sap was dug. Dug at an angle to the enemy line, the enemy couldn't fire directly down the sap, but they would try to harass the work in any way possible. As it was dangerous work, and volunteers were used. These men drew extra pay which, at least in European wars, was often used to buy alcohol or the services of prostitutes. With a protective barrier being slowly rolled forward, the first man would begin construction. Follow-on workers made the trench deeper and wider and used the dirt to fill the wickerwork gabions above. On July 6, the French and American armies met at White Plains, north of New York City. Although Rochambeau had almost 40 years of warfare experience, he never challenged Washington's authority, telling Washington that he had come to serve, not to command. Washington and Rochambeau discussed where they should launch a joint attack. Washington believed that an attack on New York was the best option, as the Americans and French outnumbered the British 3 to 1. Rochambeau disagreed, arguing that the fleet under Admiral de Grasse, which was headed to the West Indies, was going to head to the American coast afterwards where easier operations other than attacking New York could be done. In early July, Washington suggested that an attack be made at the northern part of Manhattan Island, but both his officers and Rochambeau disagreed. Washington continued to probe the New York area, until August 14, when he received a letter from de Grasse that he was headed to Virginia with 29 warships and 3,200 men, but would only remain there until October 14. De Grasse encouraged Washington to come south where they could launch a joint operation. Upon receiving this news, Washington abandoned his plan to take New York, and began to prepare his army for the march south to Virginia.